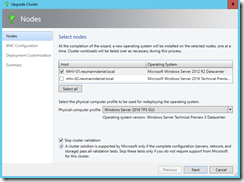 One of the best features in Windows Server 2016 will be the Rolling Cluster Upgrade capability. 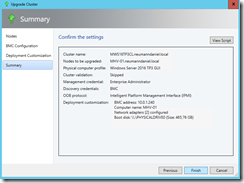 Even better you can orchestrate it with the System Center 2016 Virtual Machine Manager. The requirements are very low. 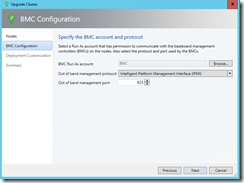 Your servers only need a baseboard management controller, you must have also a prepared VHD in your VMM library with Windows Server 2016 on it and a physical computer profile. Let us get started. 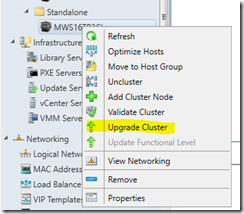 Right click on the Hyper-V cluster you want to upgrade and select Upgrade Cluster. 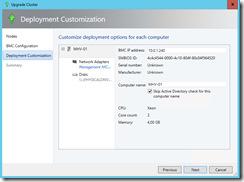 Select the nodes you want to upgrade and specify the physical computer profile. 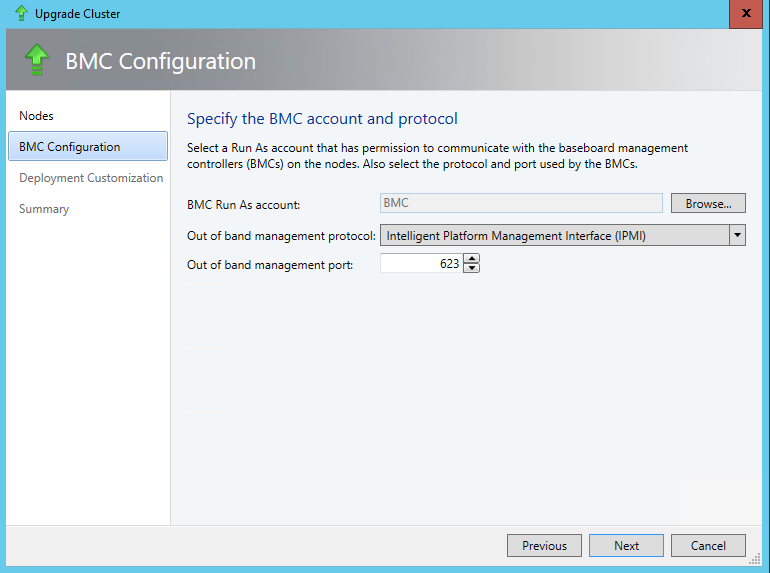 In this example I placed an already upgraded node into the cluster because I only have one server with BMC in my lab. Which leads us to another requirement for the Rolling Cluster Upgrade. 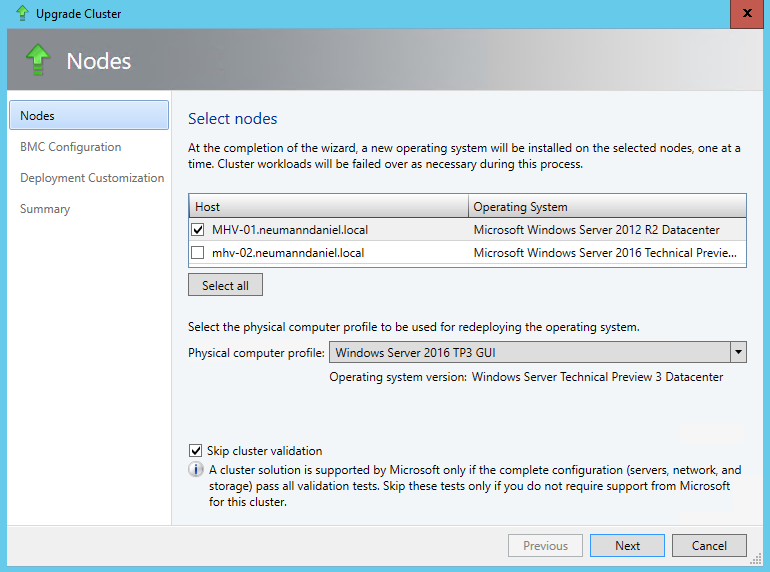 You need a minimum of two nodes in your Hyper-V cluster. 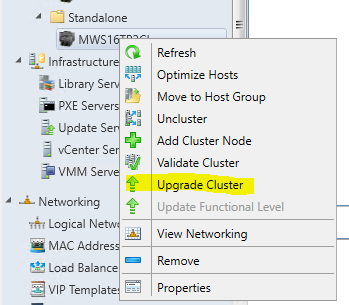 Even for a testing purpose you need two nodes otherwise the upgrade fails. 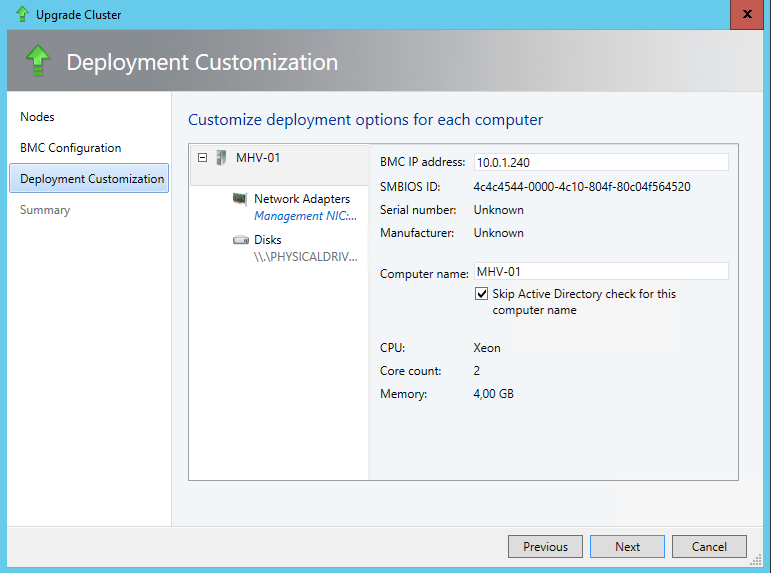 Customization is not required in my case because VMM will use the settings which are provided through the physical computer profile. Review the settings and click on Finish. You can monitor the whole process in the Jobs section. In my case the cluster validation test has thrown up an error. Before you panic, have a look into the cluster validation report and fix the issue! Afterwards restart the failed upgrade cluster job. The VMM PG has done great work here. The job will continue at the last step which has failed. Now I got a warning regarding the cluster validation test and an error that the cluster is not ready for an update of the functional level. Really? Nope, it is just a confusing error message because the functional level has already been updated. Let us have a look at our previously failed job entry. Step 1.2 says the functional level update succeeded. 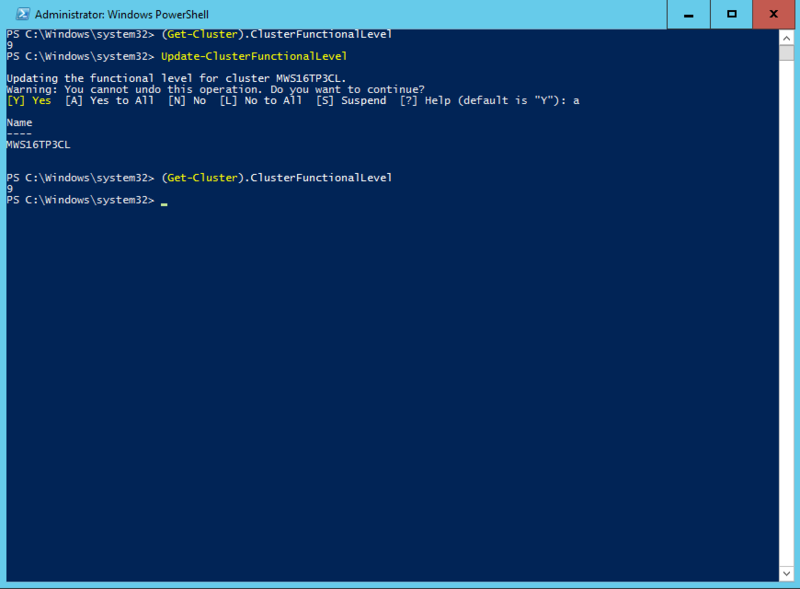 If you do not trust the VMM job entry, log in into one of the nodes and execute the following PowerShell cmdlet. 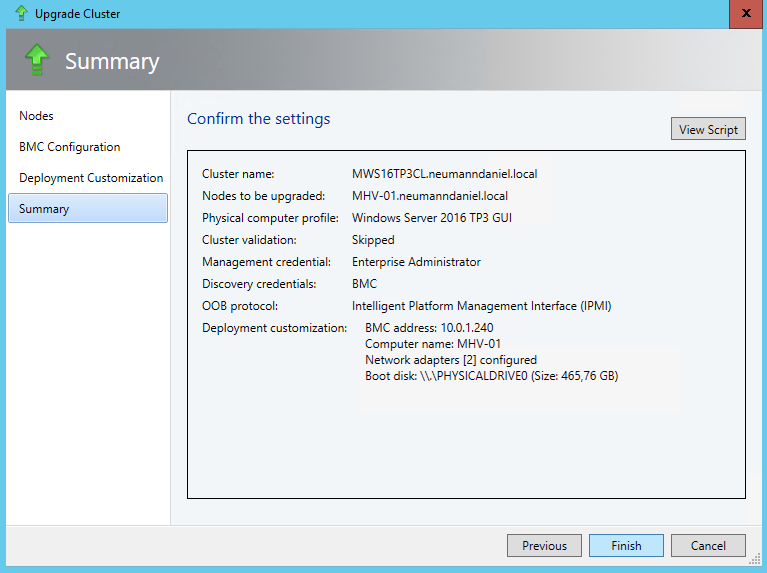 The value should be 9 and that is the number for the Windows Server 2016 cluster functional level. In the end the Rolling Cluster Upgrade has run successfully. 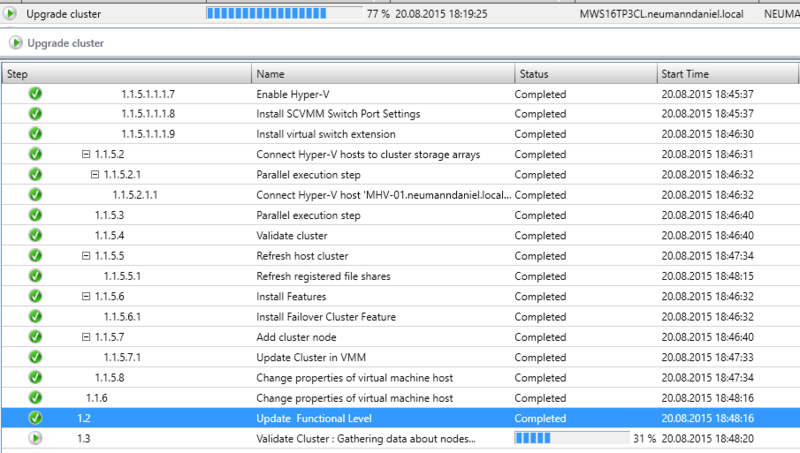 One advice from my experiences with VMM, do not get confused by the warnings and errors in the VMM Jobs log. Read them carefully and check first the things that are mentioned before you try to start again.